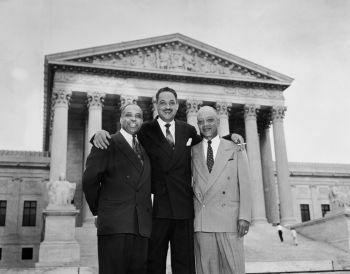 Thurgood Marshall and James Nabrit, Jr.
voting rights of blacks as well as school desegregation. Morehouse College, graduating in 1923.
teach while working on a number of significant civil rights cases. of the NAACP Legal Defense Fund throughout his career. they lost both appeals. Unlike Brown v.
due process clause in the Fifth Amendment, not under the Fourteenth Amendment. President Lyndon B. Johnson appointed him U.S. Deputy Ambassador to the United Nations. the White Primary in Texas (Columbia: University of Missouri Press, 2003).